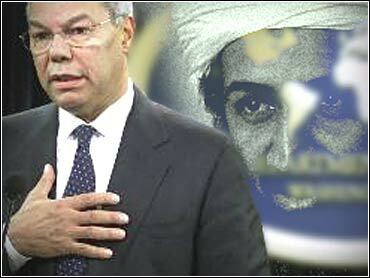 Three years after the devastating Sept. 11 attacks, Secretary of State Colin Powell said he believes Osama bin Laden is still alive, in hiding and on the run. The al Qaeda network has been decimated at top levels since bin Laden last appeared on television three years ago, Powell said. He said that bin Laden "is not showing himself in a way that he can be captured." On Thursday, though, bin Laden's second-in-command, Ayman al-Zawahri, issued a new videotape that asserted the terror group would defeat the United States in Iraq and Afghanistan. "It does have the capacity to regenerate itself," Powell said of al Qaeda. But any future leaders are not as accomplished nor as experienced as "those who have been taken out" in the U.S. campaign that overthrew the Taliban regime in Afghanistan and the subsequent hunt for al Qaeda operatives, Powell said in an Associated Press interview. The Saudi expatriate bin Laden, the target of Bush administration rhetoric after the attacks three years ago, largely has been dropped out of the U.S. lexicon. There was no direct mention of him at the Republican national convention that nominated President Bush for a second term. "I don't know where he is," Powell said. "I don't know his state of health. I believe he is still alive, but I can't prove that. He clearly is in hiding and he is on the run." Powell went on: "He is not popping up on television and he is not showing himself in a way that he can be captured." Reflecting on the three years since the Sept. 11 attacks, Powell asserted "we are safer" but "we are still in a threatening environment. There are still people who want to strike the United States." On another issue, Powell sought to ease Russia's irritation with his suggestions that ultimately there must be political dialogue to resolve the war for independence in the rebellious province of Chechnya. "How this problem of Chechnya will ultimately be solved is something for the Russians to work out," Powell said. "With respect to terrorist attacks against innocent Russians, we stand united with the Russians that they have to deal with this in the most powerful, direct, forceful way that they can in order to protect their citizens - the same as we are doing to protect our citizens." Also, Powell said North Korea would seize on disclosures that South Korea had conducted experiments with enriched-uranium and plutonium, key ingredients for making nuclear weapons. "It's quite clear that these were not intended other than for academic, experimental purposes," he said. Asked, meanwhile, if he would serve a second term as secretary of state if Bush won re-election, Powell did not rule it out. "Time will tell. We will see." "The president and I have a very strong relationship," he said. On a trip to Pennsylvania recently, Bush said he would be happy to have Powell stay on the job. "I am pleased he would say such a thing," Powell said in the interview. "But you know my standard answer." By that Powell evidently meant what he often has said - that he serves at the wishes of the president. Later, Powell ruled out serving in an administration of John Kerry if the Democratic senator from Massachusetts defeated Bush for president.